I have been lucky enough to have been riding with a Fender Bag on my bike for 3 years now. This particular Fender Bag is one of the earliest prototypes and actually designed for a large frame size, full suspension bike (Doug's bike). However, I adopted it one day when I needed a new bike bag as my seat bag had recently disintegrated. There is not much bad to say about this Fender Bag, even though it wasn't really designed for my hardtail. Although, this one is mostly glued together (bag to the fender), it has held up really well. Admittedly, I have re-glued part of the bag fender seam but that's it. Even when it was coming unglued, the Fender Bag never failed me, just a slow coming apart. I never lost any contents and the bag or fender didn't come off my bike. 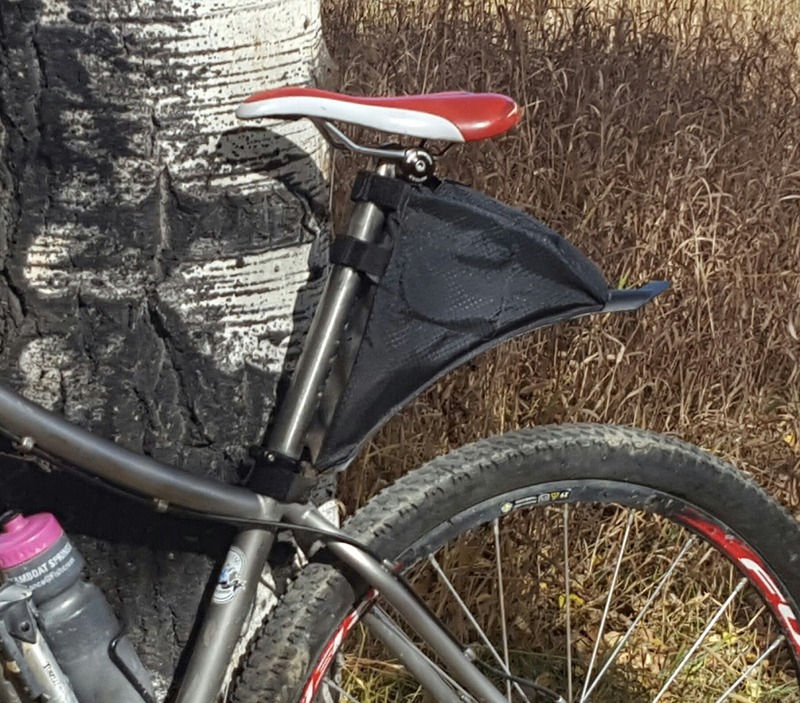 Unlike a traditional bicycle seat bag, the giggling of the contents often creates holes in the bag and, with out knowing it, tools can wiggle their way out. This doesn't happen with the Fender Bag, as the plastic fender provides that bottom support to prevent hole creation. Zipper failure has been a non-issue even when over stuffing the bag. I suppose, after enough abuse the zipper could fail as most zippers do, but even if this happens on a Fender Bag it's not as big of a deal as when this happens on a seat bag. If the zipper fails on the Fender Bag, the contents will not just drop out like on a seat bag. There is nothing worse then having a mechanical issue on a mountain bike ride, only to discover that your seat bag was not closed, not closed all the way or the zipper failed, and the contents has been distributed somewhere on the trail! Even if you forget to close your Fender Bag, gravity will keep your stuff in. The heavy items, like your multi-tool, will work their way towards the bottom, further away from flying out. It's possible that your more light wait stuff, like gloves or jacket could come out, but really only if you have over-stuffed the bag. Even then, it's not likely for anything to come out, as gravity helps keep items in. Best of all, my Fender Bag is on my bike. Like a seat bag, you know what's in it. Or, if you need to check to see what you have in your bag, it's not a big deal to inspect. You can comfortably open the Fender Bag, not having to turn upside down or squat like opening a seat bag, and easily remove or sort through the contents. The Fender Bag just makes sense to me. I never leave home with out it.